Yes! I did it! I’ve completed the MLIS through San Jose State University! My life is rich with experiences and interests. One of them is honey bees. 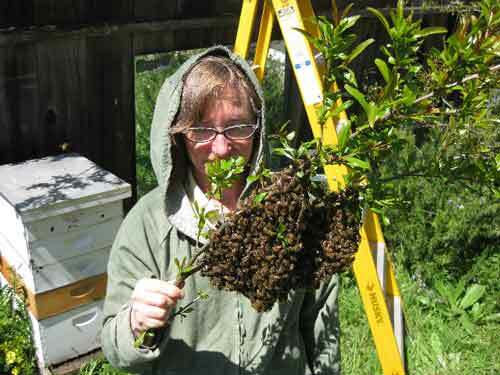 I hold a branch with a small swarm of bees. This accompanies my interest in Food! Growing, cooking and eating food as organic as possible. There is also a large pharmacy of herbs in my garden. Another of my interests is old English motorcycles, especially Velocettes. Besides riding as much as possible, I am the editor of the newsletter for the Velocette Owner’s Club of North America. 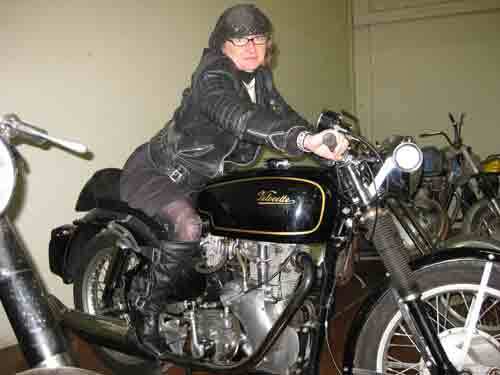 Here I am a few years ago sitting on a Velocette that was for sale. It was a beautiful bike, but I didn't buy it. Although nothing is as beautiful as these bikes, my usual ride is a 500cc Buell. It is much easier to start. I also love to read, travel, scuba dive and generally experience life as fully as possible! 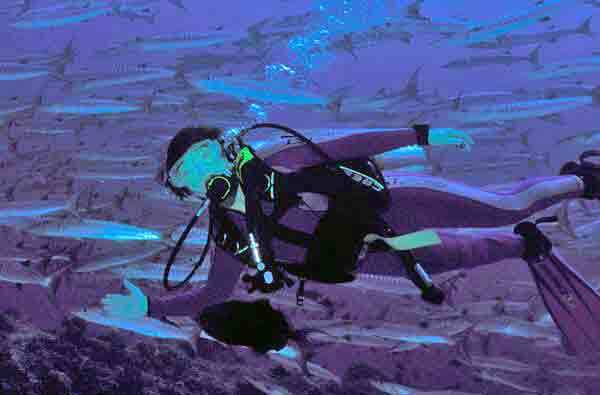 Here I am somewhere near Palau swimming with a school of barracuda. Cool blog site, Ms. Bee Gurl! I like the barracuda shot!! Thanks for forwarding the link! Lanora, thanks so much for loving my daughter, Fedora, at the Berkeley farmers market. She has loved talking with you. Many blessings. Hi Lanora, I was drawn here by a friend’s request for a “loaner” Royal Enfield with sidecar for use in the annual Mt. Tamalpais, Marin County, Mountain Home Play this coming summer. My friend knows I love old Brit bikes and have ridden anything with two wheels and a motor for nigh onto 60 years. If you have a line on anyone who would be willing to loan us their machine and sidecar for the play (not to be ridden, just a static display as far as I know) that would be wonderful. I’ve gotten great reviews so far and the book has only been out two weeks. I’ll be doing book signings and talks around Marin and the bay area in the coming weeks and months. You might also notice, under the menu bar Rides of Passage on my website, my upcoming Men’s Motorcycle tour through the Southwest. It’s a rather unique journey by motorcycle into the heart and soul of men.